Beginning in August, we learned of a controversial documentary that would be released in select theatres in time for this presidential election season. 2016: Obama’s America. It would tell the story of just who Barack Obama is and how his story defines his presidency and his plans for America. The documentary is based on the research accumulated by bestselling author Dinesh D’Souza, who traveled to three continents to gather first-hand information on the history of our president. Dinesh immersed himself in those cultures, tried to understand their politics, and conducted interviews with Obama and Soetero family members. The documentary is based on D’Souza’a book, Obama’s America, which itself built on his earlier, New York Times bestseller, The Roots of Obama’s Rage. The movie is produced by Gerald Molen, who has produced some of Hollywood’s more memorable films – Jurassic Park, Hook, Minority Report, Rain Man, and academy-award winner, Schindler’s List. The question was whether the documentary would see the light of day and whether it would be shown in enough theatres to get the message out. At first, chances looked slim. North Carolinians who went to the movie website were told that only 2 theatres in their state would be showing it. Then magically, and quickly, more and more theatres began to be added to the list. A miracle!! In an era when liberals control the media, media outlets, and the film industry, no one could have expected the film to be shown even in a place like my town of Greenville, NC !! We remember the hassle we went through to try to see the Atlas Shrugged. As it turned out, people have been flocking to see the documentary. I went to see it on a Friday night, and even though Sylvester Stallone’s movie The Expendables 2 and Will Ferrell’s movie The Campaign were showing, the showing was packed. Absolutely packed !! The earlier showings were full as well. Not packed necessarily, but full. 2016: Obama’s America is already a commercial success! It has become the top-grossing conservative political film of all time since its expanded opening on Friday, August 24. As of Monday, August 27, the film had grossed an estimated $10.5 million, according to BoxOfficeMojo.com… This amidst the scurry of getting children ready and back to school and sending college-age children off to campus !! 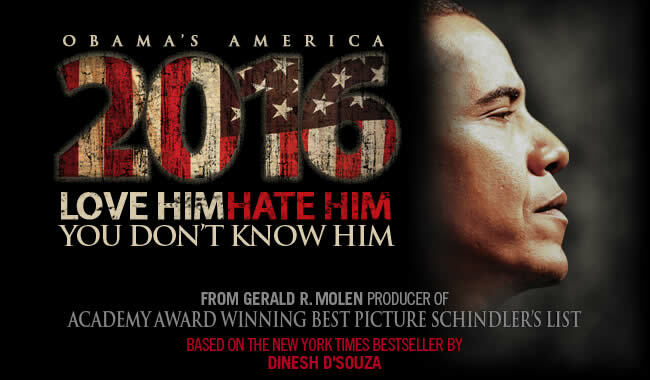 Director and star Dinesh D’Souza is hoping that “2016: Obama’s America” will eventually eclipse the total earned by Michael Moore’s left-leaning 2004 film Fahrenheit 9/11, which ranks as the highest-grossing documentary in box-office history. It also had the backing and promotion of a major motion picture studio – Lions Gate (which 2016 did not have). As the movie’s website explains: “2016: Obama’s America takes audiences on a gripping visual journey into the heart of the world’s most powerful office to reveal the struggle of whether one man’s past will redefine America over the next four years. The film examines the question: ‘If Obama wins a second term, where will we be in 2016?’ Across the globe and in America, people in 2008 hungered for a leader who would unite and lift us from economic turmoil and war. True to America’s ideals, they invested their hope in a new kind of president, Barack Obama. What they didn’t know is that Obama is a man with a past, and in powerful ways that past defines him – who he is, how he thinks, and where he intends to take America and the world. In the documentary, as in his book, Obama’s America, D’Souza lays out what Obama plans to do in a second administration (hence the year in the title 2016). He predicts a makeover of America so drastic that the “shining city on a hill” will become a shantytown in a rather dangerous global village. As mentioned above, author Dinesh D’Souza traveled all across the country and to Africa and Asia (Indonesia) in order to research the background of the enigma who the American people have entrusted with the presidency of the United States. Obama’s father lived most of his life in Kenya, an African nation once colonized by the British (The British Protectorate of Kenya). In 1959, he received a grant and was admitted to study at the University of Hawaii, where he ultimately met Ann Dunham (“Stanley Ann Dunham”) in a Russian language class in September of 1960. She would drop out of school shortly after that, after becoming pregnant by Barack Sr., who was still married to another woman – a woman named Kezia, back in Kenya – with whom he’s had two children. Ann and her foreign lover were married in a secretive ceremony in 1961, to which no one was invited. She was 3 months pregnant at the time. Barack Jr. was born on August 4, in Honolulu, as the reports go. Dunham and Obama Sr. separated in June 1962, when he moved to Massachusetts to pursue further education – this time at Harvard. In 1964, she filed for divorce after finding out that he was, in fact, married to Kezia. Barack Sr. simply moved on to another – an American school teacher – who bore him 2 more children. They moved to Kenya in 1965 after he received his Masters from Harvard in economics. In 1965, Ann re-married as well. She married Lolo Soetero, an Indonesian student she met when she resumed her studies at the University of Hawaii. Lolo was Muslim. Although Obama Sr. and Dunham divorced, she continued to hold him in the highest regard. She was mesmerized by his intellect and his radical ideology. She shared his left-leaning, third-world view. As D’Souza details in 2016, Soetero tried very hard to provide Ann, Barack Jr., and the daughter they had together with a good quality of life. He quickly worked himself up in the business world, but instead of making Ann happy, it only increased the tension in their marriage. During their years in Indonesia, Dunham became increasingly interested in the country’s culture, while Soetoro became more interested in Western culture, and their relationship was in conflict over differing values. He was becoming too “westernized” for her. At that time, Obama was sent to spend the summer with his grandparents, Stanley and Madelyn Dunham, in Hawaii. That was 1970 and he was getting ready to enter the 4th grade. During that summer, his grandparents took him to interview with the Punahou School, the most prestigious prep school in Hawaii. Ann sought to separate Obama (young “Barry”) from Lolo’s growing pro-Western influence. She went him back to Hawaii to live with her parents so he could be educated at Punahou, where he would be indoctrinated with the anti-colonial views of the Hawaiian natives who believed they were coerced and marginalized by the US government for sugar cane and other resources, in becoming the 50th state. “Oppression studies, if you will. Obama got plenty of that when he was here in Punahou,” D’Souza says in the documentary, standing on the school’s campus. Although Obama barely knew his father – he would only visit him once, in Hawaii in 1971 when he was 10 years old – Obama is clearly obsessed with this undefined and unfulfilled relationship. Perhaps as is the case when a child feels “abandoned” by a parent, he is going through extreme pains to find a connection with him in order to ultimately make him proud, even posthumously. D’Souza sees a clue for this explanation in Obama’s book title: Dreams From My Father, and not Dreams of My Father. Obama admits in the book that his father’s struggle and politics are “my birthright.” The father died at age 46 in a car crash, after drinking heavily. D’Souza believes that this short life and the estranged relationship is what reinforced rather than weakened the president’s ties to his father. Obama went to great lengths to try to figure out who he was and why his mother had such great respect for him, as a thinker. What is the source of Obama’s political rage? D’Souza concludes that his “birthright” includes the rage of Third World nations which have been victimized by ‘colonial’ nations like Britain and the United States. What is the dream that he got ‘from’ his father? D’Souza believes that it is the demise of the stature and influence of such countries in the world so that Third World nations can rise and take their rightful place, finally enjoying wealth and prosperity because of an opportunity to compete. Indonesia and Kenya were both colonized and exploited to some degree by the Dutch and the British, respectively. They are both poor nations. Obama came to believe that third-world nations are poor because of this colonization and exploitation and for that reason, he is pushing a policy of neutralizing world powers to level the playing field for third world nation. This is the basis of Obama’s “anti-colonial” approach. This is the dream ‘from’ his father. Given a second term, Obama would continue down a destructive path for the United States, and the stability of a world that ultimately seeks freedom and respect for the dignity of human life. He would further reduce the power of the United States (both economically and militarily), he would favor the empowerment and rise of the Third World, greatly reduce Israel’s influence, further distance the US from that gem in the Middle East, shred the US Constitution in order to erode individual rights and stifle ambition (which is one reason for America’s economic power), concentrate power in the presidency, and cede the U.S. role as a superpower. This goal to see Israel (the “Trojan Horse”) destroyed became further evident when D’Souza detailed Obama’s current nuclear strategy. Obama has cut our nuclear warhead arsenal from 5000 to 1500 and intends to take that number to 300 and then to 0. I believe when he spoke off-mic to the Russian official about upcoming promises and assurances to Russia (in his second term), this is precisely what he was referring to. No other problematic nation in the world is cutting their nuclear weapons. Iran is building its arsenal. With a nuclear-free America, we offer no assistance to Israel. There will no longer be a deterrent in the eyes of the Islamic world. On paper we can be “friends” to Israel but in reality Obama is giving Islamists the green light to annihilate Israel. While the documentary was especially compelling and clearly the result of impeccable research, as defines all of Dinesh D’Souza’s books, I was left wishing that he could have spent more time on three topics – the authorship of Obama’s book Dreams From My Father, the authenticity of his Hawaii “Certificate of Live Birth,” and the roots of Obama’s Muslim faith. Dreams of My Father was first published in 1995, as Barack Obama was preparing to launch his political career, and five years after being elected the first African-American president of the Harvard Law Review (in 1990). There is speculation that Obama’s book – described as a book about “race and inheritance” and promoted as his memoir – was not written by him, but rather was written by domestic terrorist Bill Ayers. I was hoping D’Souza would have addressed this claim, and if it is indeed true that Ayers penned the book, what was the relationship between he and the-Senator Obama. In the movie, D’Souza states that Obama was born in Hawaii. He says “it was announced in two newspapers.” Yet Obama has never released an authentic birth certificate. It has never been produced. I’ve gone through many stages in my life, and at several of those stages, including my marriage and education, I had to produce my birth certificate. What we all know, thanks to Arizona’s Sheriff Joe Arpaio and his Cold Case possee, is that the Hawaii birth certificate that Obama released in 2011 and which the White House posted on its official site is a proven forgery. Other sources (British records) show that Obama was born on August 4, 1961 in Mombasa, Kenya (officially, the “British Protectorate of Kenya”) and not in Hawaii. Aside from his marxist/socialist leanings, his disrespect for the US Constitution, his embarrassment over the history of the United States, his traitorous position with respect to Israel, and his rebellion against all traditional American institutions, one of the most offensive aspects of Obama’s presidency is his promotion of Islam and the Muslim agenda. We find it offensive that just 11 years after the brutal, cold-hearted massacre of 3000 innocent American lives in planes and in twisting, burning, crashing high-rise towers, we have a president that celebrates Ramadan in the White House, yet declines to offer a prayer from the White House in honor of the National Day of Prayer, which acknowledges our Christian heritage. In the United States, Christians have never slaughtered their fellow countrymen. We find it offensive that while Obama claims to be a Christian, he spent his time in a church that spewed hatred – thanks to Reverend Jeremiah Wright. Yet he consistently refers to Islam as a religion of peace. Is Barack Obama a Muslim or Christian? His actions tell us that in his heart and conscience, he is a Muslim. We are told that his father, Barack Hussein Obama Sr, was a Muslim. There are some accounts, however, that say he converted to Christianity before he met Ann Dunham, but was forced to do in order to study at the boarding school he attended (a Christian boarding school). We have also read that Lolo was a Muslim as well. But reports say that he was very relaxed when it came to religion. So where did Obama’s deep Muslim roots come from? 2016 didn’t address this question. For me, the documentary made its point very clear: No matter what our personal opinion may be of Barack Obama, there is one common truth. We didn’t know him when we elected him. For me this profound realization begs the question: How is it that we’ve reached a point where we are so cavalier with our country, our foundations, and our Constitution as to elect an unknown who has seen to use his time in the Senate to vote “Present” rather than strengthen American values? Looking at the movie, it is clear that his decision to vote “Present” was a crafted and scripted plan so that he could run on ‘Hope & Change” without a record to define that campaign promise. Let us reflect on who the culprits are. The American people are guilty, of course. They elected him. But they were constrained to some degree by the choice given them and naive because they think it’s reasonable to trust the powers above them to do the right thing. But the Democratic Party didn’t do the right and honorable thing. It intentionally deceived and lied to the American people by putting forth a candidate not loyal to America and not even able to prove he is a natural born citizen. They knew his background. They knew his ties to Chicago corruption. They knew his mentors and his distorted views of race relations, thanks to 20 years of Reverend Wright. They knew of his deep-seeded resentment of America because of what he wrote in his book. The Democratic Party was dishonest in taking advantage of Obama’s race and the guilty conscience that Americans collectively feel in the history of their country over slavery and civil rights by putting forth a radical-minded candidate who would promote a collectivist government agenda. The way I see it is that since political parties are so heavily regulated by the federal government, this government action is sufficient to indict the government in this massive scheme of fraud and deception. Will the election of Barack Obama be this era’s “Kennedy Assassination” ? Every American who is concerned as to the direction our country is heading, who isn’t naive enough to believe that Obama isn’t making a profound footprint on the international scene, and who wants to understand who this man is that we elected on a huge leap of faith should see this important and well-researched documentary. It’s time we connect the dots.